High quality Granite for luxurious homes in need. We install granite in kitches and bathrooms! Custom colors to help you match all rooms. Trust us, our granite is beyond beautiful! Custom edges for our granite countertops. Don't be a square, get some amazing detailing with us! Are you in need of granite for your kitchen or bathroom? We have more than 100 slabs to choose from in all types of different colors. Our prices start out very inexpensive for remnant slabs and go up much higher for some of the very rare and hard to find granite slabs. We can do a job of any size and have the staff to get your job done in not only a short amount of time but we can get it done with perfect quality. If you aren't sure what you want feel free to give us a call now for a free in home estimate and we can bring some of our samples so you can pick what color of granite you would like to use on your project. We deal in all types of stone. We stock not only marble but granite, limestone, slate, quarts, and soapstone. We recommend picking what type you would like first and we can bring the samples to you and give you your best options. We’re really passionate about our products! We believe that the right granite choice can really make a kitchen or bathroom pop. You spend so much time making decorating decisions and choosing the right fabrics and tile for each room… don’t skimp on the countertops. It’s the thing that catches your eye when you first walk in and it really does leave a lasting impression. Properly cared for, they can last you a lifetime and become that cornerstone of your home that just ties everything together! Give us a call any time to set up your best option. We can do any project from a kitchen or bathroom counter to just window sills or a home bar remodel. Do you have any of these projects at a standstill in your home? So many times, life gets busy and a remodeling project barely begins before it gets stuck in limbo. Don’t let that be the case with your countertops or whichever creative use you have found for our exquisite granite. Give us a call today and let us know precisely what you need from us to make your home project a major success that makes a huge impression on everyone that walks into your home. We’ve got a huge array of colors and styles to choose from and we go into some detail about that below. The options really are endless and we can help you choose the perfect product to go with your current décor scheme. What you may not know is that we also offer tile service, so if you need some gorgeous matching tile to really set off that granite, we’ve got you covered there too! If you take a look through our site, you’ll find that we detail our most popular granite color choices as well as detailing the different edges that you have to choose from. We’re most partial to Bahama Blue and Ebony Mist, and the demi bullnose or large ogee edges are the ones that are most pleasing to our eyes! But it’s all up to you. Our materials page gives you a little bit more of a behind the scenes look at our process, so if you’re the type who likes to know everything there is to know, you will definitely enjoy the information we’ve packed that page with! If you’re wondering which areas we service most often, please take a look at our service area page. It’s not by any means an exhaustive list as we are more than willing to travel beyond our typical service area for most jobs, but it gives you an idea of the places that you’ll find us most often. To be sure whether or not we can provide service to your particular area, just reach out via phone or email and we will be happy to let you know. We’re really excited to hear from you and to begin thinking about all the ways in which we can make your finished project an incredible one. If you’ve got the time to talk about it, so do we, and we just cannot wait. Just give us a call at your earliest convenience and let’s plan your project down to the most minute of details! If you aren't looking for granite we also offer tile service. We can tile any project that you may need. 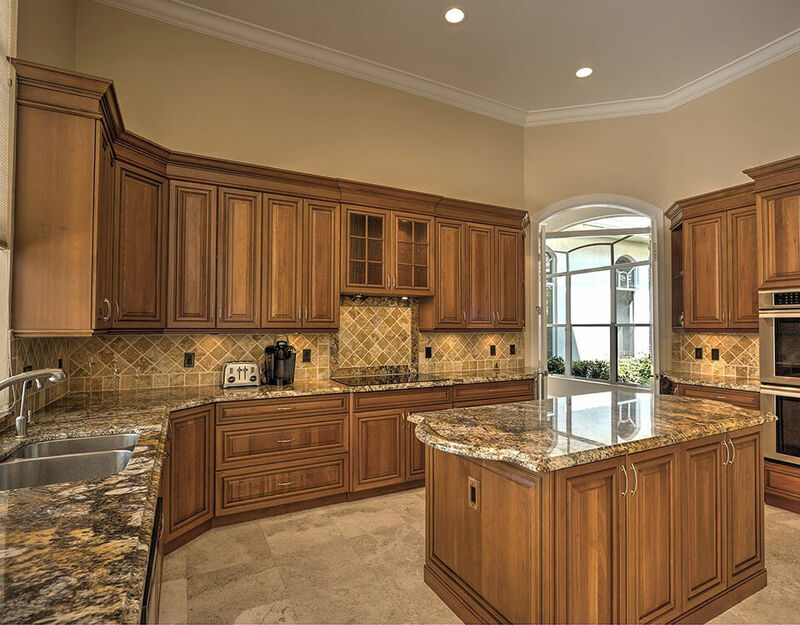 If you are looking for a kitchen remodel we also offer cabinets and full kitchen remodel jobs. Call us any time 24/7 for a quote on your next granite purchase or kitchen remodel. www.grandrapidsgranite.com | All Rights Reserved.